Which Store Layout Suits Your Business Best? 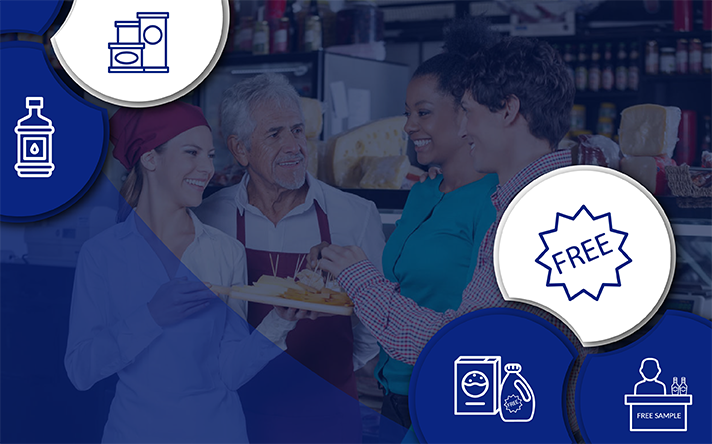 Regardless of whether you are planning a new store opening, store revamp or just general store maintenance, the layout of your store is more crucial to your overall performance than you may think. After all, picking the right layout design will allow your customers to shop your store with ease. Also, as a retailer, your store layout acts as a powerful tool for communicating and creating the image of your store for your customers. And you need to present the right image. 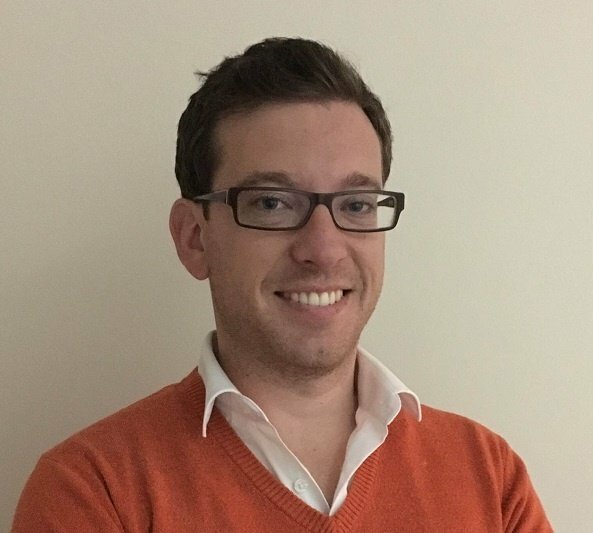 Besides projecting the right image of your store, there is also the added note that the store layout you choose can mean the difference between your maximising sales (by keeping your customers in your store for longer) or confusing your customer so much that they walk out your store. 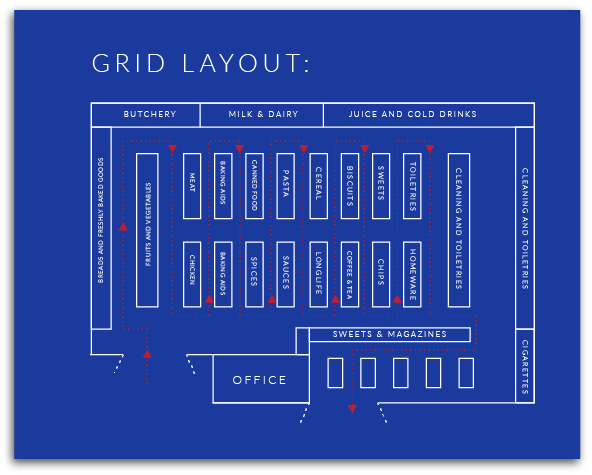 The first - your grid store layout – is also the most traditional design seeing as it’s used mostly by supermarkets, pharmacies and off-price retailers. As for how your store would look with this layout, your retail fixtures are placed in long rows, otherwise known as ‘runs’. 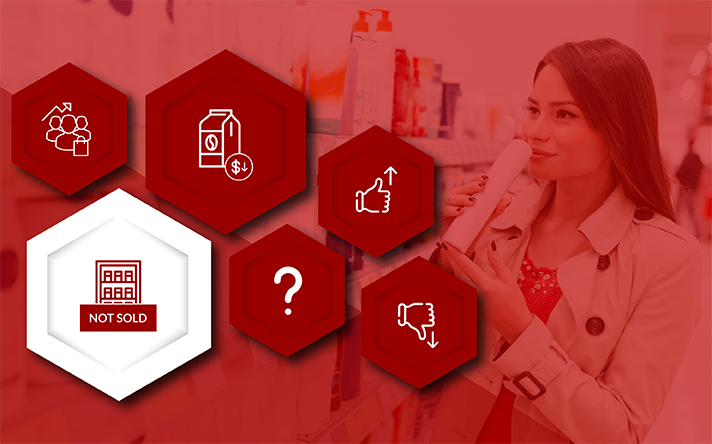 They’re also usually located at right angles throughout your store, which allows your customers to become familiar with where your products are placed. When done properly, it also allows your customer to shop your entire store. Your store is well organised and has an atmosphere of efficiency, which leads to customer familiarity. The maximum amount of floor space is used at a lower cost. It’s easier for merchandisers to stock your shelves. The many rows in your store can give off a cold and sterile atmosphere while it’s also difficult to see over your rows. There are few opportunities for special displays, and your store can appear plain and uninteresting to your customers. This layout can stimulate rushed shopping behaviour. Considered as the simplest type of store layout, your free-flow layout groups your fixtures and merchandise into a free-flowing pattern on your sales floor. That essentially means that there is no defined traffic pattern, so your customers are free to browse your merchandise at their leisure. That makes it seem like there are no rules for this layout, but that’s not true. There are rules but just not as many. Ironically, this can be the most complex layout to master considering that you need to keep your customer’s behaviour and buying patterns in mind. Just a note of warning, should you have a wide variety of merchandise, this layout fails to provide cues to your customers for them to know where one department ends and another one begins. This layout allows your customers to browse and wander freely. There is an increase in impulse buying as your customers are exposed to merchandise more thoroughly. Your store is visually appealing as there is an opportunity to create unique and exciting displays. You don’t make the most of your floor space. Your stock control and handling are more complex than other layouts. Loitering is encouraging, which can confuse your customer. Also known as your race track layout, the point of your loop layout is to expose your customers to as much of your merchandise as possible. Unlike your free-flowing layout, the path your customers take is very much controlled. 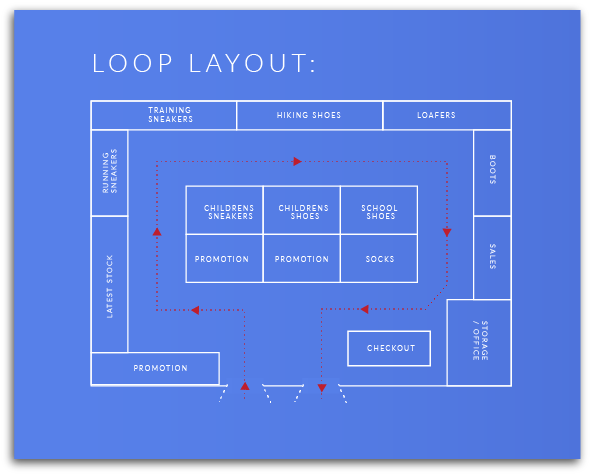 In fact, there is a reason why it’s called the loop layout as your customers are directed in a so-called ‘closed loop’ around your store, taking you past all your products before arriving at your check-out counter. You have an opportunity to create unique displays for your store. It allows for a friendly and relaxed atmosphere. Your customers are exposed to more of your merchandise. 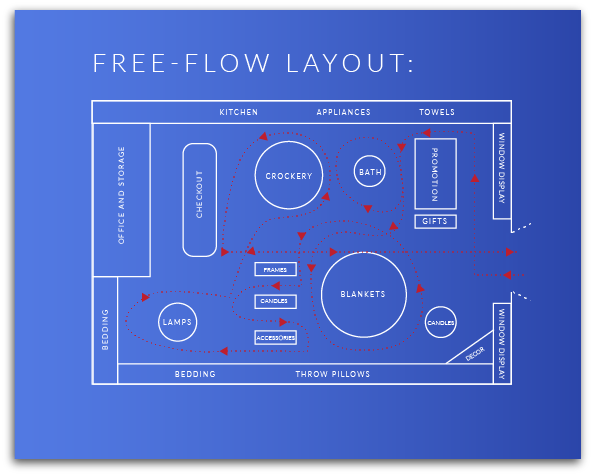 Similarly to your free-flow layout, in using this design format, your selling space is wasted. It doesn’t encourage your customers to browse. Can be frustrating for customers who know what they want to buy. While your grid layout may be the most used layout form for retailers, if you have a small retail space, it might not make sense. 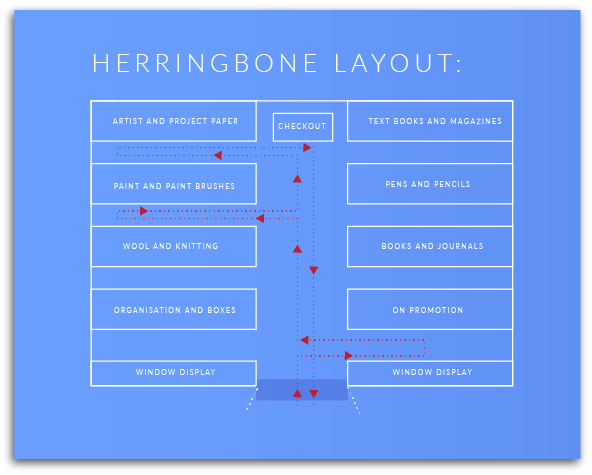 That is where your Herringbone layout comes in. Best used for retail spaces that are both narrow and very long, this layout makes use of a single passageway that runs through your store. Off this passageway, you’ll have a series of paths, which can go all the way to the wall, thus allowing you to make the most of your retail space. To keep your customers in your store, you can also break up your space by offering areas to relax, such as a chair in a bookstore or a bench in a shoe shop. Best suited to stores with a lot of product on their shelves but with minimal space. It adds visual appeal to your store. You can make the most of your retail floor space. Limited visibility of all your paths, which can allow for an increase in shoplifting. This layout can make your store feel cramped. There is a limited scope for browsing. 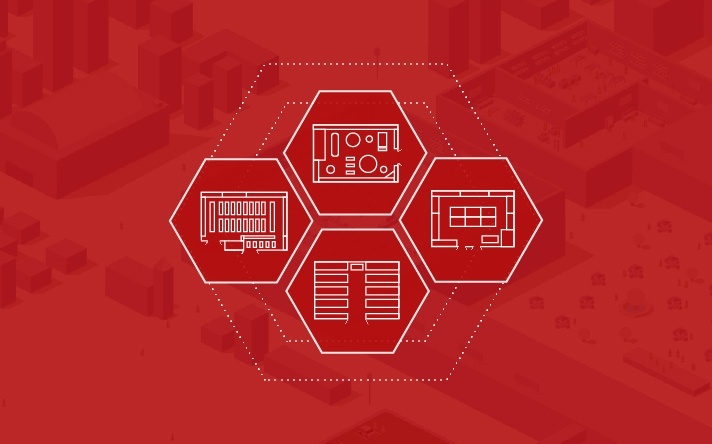 When it comes to choosing a store layout, you don’t only have to pick one of the above. Many successful retail stores use a combination. Rather it comes down to the products your store sells, the space you have available, and deciding what you want your customers to do upon entering your store.